On the shelf, in the fridge, canned or frozen? With the cost of food as high as it is, and to preserve the taste and nutritional benefit of vegetables and fruits, it is important to know how long food will keep its taste, texture and nutritional value using the available storage methods at home: the refrigerator, freezer, on the counter or canned. The table below lists the estimated storage life, for best quality, for various fruits, vegetables and products from these for each of the home storage methods. Canned and frozen fruit, vegetables and products may be safe beyond these dates if their packaging is intact and the temperatures were maintained; but they are likely to show degradation in text, appearance and texture. This chart assumes that you started with ripe, but not over fruit fruit and vegetables that were not bruised, moldy, cut open or otherwise damaged. See the explanation at the bottom of the page, following the chart for more details of assumed storage conditions. Finally, this chart is a work in progress; it's going to take a month or two for me to complete it as it is a combination of research and my own 40 years of experience with home preserving... and there are a LOT of fruits, vegetables and forms of storage here!. Apples fresh Fridge, fruit drawer 30-40 -1-4 90-95 1 week 3 weeks to 3 months 3 weeks to 3 months 1 year 1 year 1-12 months Chill sensitive stored at 35-40 F (2-4 C) It really depends on the variety. Hard, drietr apples, like Fuji's can store for months. SOft, sweet, moist apples, like Gals sppoin within weeks. Carrots, bunched fresh 32 0 95-100 4-6 weeks 4-6 weeks 4-6 weeks Ethylene may cause a bitter flavor,trim the tops to 1/2 inch. Carrots, immature fresh 32 0 98-100 4-6 weeks 4-6 weeks 4-6 weeks Ethylene may cause a bitter flavor,trim the tops to 1/2 inch. Carrots, mature fresh 32 0 98-100 4-8 weeks 7-9 months 7-9 months Ethylene may cause a bitter flavor,trim the tops to 1/2 inch. Several vegetables benefit from post-harvest curing. Curing heals or suberizes injuries from harvesting operations. It thickens the skin, reducing moisture loss and affording better protection against insect and microbial invasion. Curing is usually accomplished at an elevated storage temperature and high humidity. Produce can be cured in home storage areas. Temperature and humidity should be managed as accurately as possible. A space heater in an enclosed area can provide the needed heat for curing. Humidity can be increased by over-laying containers with sheets of plastic. After harvesting, these must be subjected to the heat and humidity identified below for the length of time shown, to cure the vegetable to make it last longer in storage, then stored at the temperature indicated. It sounds crazy at first, but many root crops such as beets, carrots, rutabagas, parsnips and turnips can be left in the garden into late fall and early winter. A heavy mulch of straw will help prevent the ground from freezing so the roots can be dug when needed. The mulch will also maintain the quality of the roots, as it will reduce repeated freezing and thawing of the vegetables. Many people prefer the taste of these root crops after they have been frosted because their flavors become sweeter and milder. You may ned to use chicken wire or hardware mesh to make an underground cage in which to store the vegetables to keep ot mice, rats, racoons, possums, squirrels, chip[munks, etc. When temperatures drop low enough to freeze the ground under the mulch, finish harvesting the roots. Cut off all but one-half inch of the leafy top and store at 32° to 40°F in high humidity to reduce shriveling. Irish Potatoes ; Late-crop potatoes are better for long-term storage than early potatoes since outdoor temperatures are usually lower when they are harvested. After harvest, cure late potatoes by holding them in moist air for 1 to 2 weeks at 60 to 75°F. Wounds will not heal over at 50°F or below. After curing, lower the storage temperature to about 40-45°F. Potatoes will keep even longer at 35-40°F but at 35°F, potatoes tend to become sweet. This condition can be corrected by holding the potatoes at about 70°F for a week or two before you use them. Potatoes will keep well for several months in a cool basement or cellar. They keep best in moderately moist air which helps prevent shriveling. Do not wash potatoes before they are put into storage. Store potatoes in the dark; exposure to light causes them to turn green. The green pigment contains the toxic alkaloid solanine. Green sections of potatoes should be removed before cooking. Onions can be harvested when the tops have fallen over and begun to dry. Do not bend over the tops during the growing season to "force the energy into the bulb." This practice reduces the growth of the onions as they will not be able to translocate sugars to the bulb for storage. Commercially, onions are dug, windrowed and allowed to cure in the field before they are picked up. Home gardeners should cure onions after harvest by spreading them in a single layer on screens in the shade or in a well-ventilated garage or shed for 1 to 2 weeks or until the tops are completely dry and shriveled. If the bulbs are exposed to full sun, prevent sunscald by covering with a light-weight cloth. When the tops are dry, they should be trimmed to 1 inch lengths. Leave the onion's dry outer skins on; they help reduce bruising and shrinking and act as an insect barrier. Store onions in shallow boxes, mesh bags or hang them in old nylons in a cold, dry, well-ventilated room. The tops may be left untrimmed and braided together. Temperatures close to 32°F will give the longest storage. Products prone to absorb odors or flavors should not be stored close to onions. Sweet and Hot Peppers ; Mature, green bell peppers can be kept for 2 or 3 weeks if handled properly. Firm, dark-green peppers free of blemishes and injury are best for storage. To prevent chilling injury, pick peppers just before frost or before frost threatens if daytime temperatures are consistently below 45°F. Wash them with water containing 1 1/2 tsp. of chlorine bleach per gallon of water. Dry and sort according to maturity and firmness. Store peppers in boxes lined with plastic or in plastic bags which have several 1/4" holes punched in them to maintain high humidity. The temperature should be between 45 and 50°F. Fully mature green peppers may turn red during storage. Hot chile peppers are easiest to store after they are dry. One exception is habanero or Scotch bonnet type peppers. These do not dry well except in a dehydrator. Peppers can be dried by either pulling the plants and hanging them upside down or by picking the peppers from the plants and stringing together. Ripe chili peppers can be dried in a forced air dehydrator, but it is usually not necessary to do so. Tomatoes ; With care, mature green tomatoes will keep and ripen for about 4 to 6 weeks in the fall. Some cultivars have been developed for even longer storage. Tomatoes from nearly spent vines are more subject to decay and are usually not as good quality as those from vigorous vines. A late planting of tomatoes will provide vigorous vines from which fruit can be harvested for storage. Harvest tomatoes just before the first killing frost. If an unexpected frost occurs, undamaged fruits can be salvaged and ripened. Prevent chilling injury to the fruit by harvesting everything when temperatures drop regularly to 32° to 50°F. To store, pick the tomatoes and remove the stems. Reduce rots by disinfecting fruits by washing in water with 1 1/2 teaspoon of chlorine bleach per gallon of water. Dry thoroughly with a soft cloth. Pack tomatoes 1 or 2 layers deep in shallow boxes. Reduce bruising by separating those showing red; they will ripen sooner and can be used first. Pumpkins and Winter Squash ; Harvest mature fruit with hard rinds before frost. Leave the stem on when cutting from the plants to prevent decay organisms from entering. Pumpkins and winter squash will keep best if they are cured for 10 days at 80-85°F. Acorn squash, however, should not be cured but stored at 45°F to prevent stringiness. Apples ; Many cultivars of apples store moderately well under home storage conditions for up to six months. Late maturing varieties are best suited to storage. These apples can be stored in baskets or boxes lined with plastic or foil to help retain moisture. Always sort apples carefully and avoid bruising them. The saying "one bad apple spoils the barrel" is true because apples give off ethylene gas which speeds ripening. When damaged, ethylene is given off more rapidly and will hasten the ripening of other apples in the container. Because of their sugar content, apples can be stored at 30-32°F without freezing the tissue. In general, apples ripen about four times as fast at 50°F as at 32°F, so they should be kept as close to 32°F as possible for long-term storage. Apples often pass their odor or flavor to more delicately flavored produce and the ethylene given off by apples can accelerate ripening in other crops. When possible, store apples separately. Pears ; For good flavor and texture, pears, except for 'Seckel' must be ripened after harvest. Pick pears when they are fully mature. Fruit is ready to harvest while it is quite firm but the color has lightened to a pale green. It should part easily from the branch when you lift up on the fruit and twist. Pears left to ripen on the tree tend to become grainy or stringy. The center also may turn brown before the exterior shows deterioration. Pears ripen quickly after harvest when held at 60 to 65°F. Ripening will take 1 to 3 weeks, depending on the type of pear. After ripening, pears should be canned or preserved. To keep pears longer in storage, sort for defects after picking and place sound fruit into cold storage at 29-31°F and 90% humidity. Ripen small amounts as needed, by moving them to a warmer location, 60-65°F. Too high of temperatures (75°F and higher) will cause the fruit to break down without ripening. All fruits and vegetables have a 'critical temperature' below which undesirable and irreversible reactions or 'chill damage' takes place. Carrots for example blacken and become soft, and the cell structure of potatoes is destroyed. The storage temperature always has to be above this critical temperature. One has to be careful that even though the thermostat is set at a critical temperatures for various fruits and vegetables. Temperatures that are too low can be just as damaging as those too high. Freezing will occur in all commodities below 32°F. Whether injury occurs depends on the commodity. Some can be repeatedly frozen and thawed without damage, while others are ruined by one freezing. Table 1 shows the highest freezing point for most fruits and vegetables. Table 3 lists susceptibility to freezing injury. Produce that is likely to be injured by one freezing is classified as "most susceptible." The "moderately susceptible" produce will recover from one or two freezings. Produce which is "least susceptible" can survive several freezings without injury. Injury from freezing temperatures can appear in plant tissues as loss of rigidity, softening and water soaking. Injury can be reduced if the produce is allowed to warm up slowly to optimum storage temperatures, and if it is not handled during the thawing period. Injured produce should be marketed immediately, as freezing shortens its storage life. Fruits and vegetables that require warmer storage temperatures (40 to 55°F) can be damaged if they are subjected to near freezing temperatures (32°F). . Both time and temperature are involved in chilling injury. Damage may occur in a short time if temperatures are considerably below the danger threshold, but some crops can withstand temperatures a few degrees into the danger zone for a longer time.Cooler temperatures interfere with normal metabolic processes. Injury symptoms are varied and often do not develop until the produce has been returned to warmer temperatures for several days. Besides physical damage, chilled produce is often more susceptible to disease infection. The table below lists susceptible fruits and vegetables, The effects of chilling injury are cumulative in some crops. Low temperatures in transit, or even in the field shortly before harvest, add to the total effects of chilling that might occur in storage. Crops such as basil, cucumbers, eggplants, pumpkins, summer squash, okra, and sweet potatoes are highly sensitive to chilling injury. Moderately sensitive crops are snap beans, muskmelons, peppers, winter squash, tomatoes, and watermelons. (8) These crops may look sound when removed from low temperature storage, but after a few days of warmer temperatures, chilling symptoms become evident: pitting or other skin blemishes, internal discoloration, or failure to ripen. Tomatoes, squash, and peppers that have been over-chilled may be particularly susceptible to decay such as Alternaria rot. These products can be iced. These items are damaged by direct contact with ice. Places around the home that are suitable to store some vegetables and fruit. 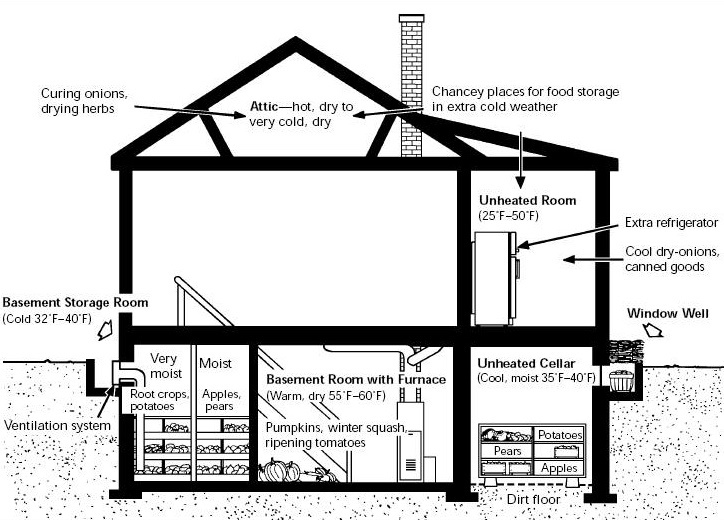 Figure - Areas in a house that could be used for storage.